In what is perhaps his first on-camera interview, at the Russell Simmons’ Get Your Money Right summit in 2006, Hussle spoke plainly about leaving behind the material things synonymous with hip-hop lifestyle — the diamonds, the flashy cars — to secure the financial future of his family and people in his community. “I’d rather invest in some real estate,” Hussle said. “So you trying to get land?” Davey D asked. “Exactly, homie, a real asset to take care of my people,” Hussle said matter-of-factly. Marathon Clothing sits at that Crenshaw/Slauson intersection, one of the main hubs for businesses in South L.A. The apparel shop is a “smart store” that uses an app so customers can see exclusive content from the rapper. Hussle enlisted the help of software engineer Iddris Sandu to create the app and build the store, after a chance meeting at a Starbucks store a couple years ago. In February, Hussle and his business partner, David Gross, bought the entire plaza at that intersection, with plans to knock it down and build it back up with a six-story residential building atop commercial stores, Forbes reported. Gross is also founder and CEO of Vector 90, a coworking space and STEM incubator for young people to gain training, professional development and other tools to build their own businesses. Hussle, who invested in Vector 90, has long had an interest in technology and hoped to help bridge the gap between black and brown children in his community and technology entrepreneurs and CEOs in Silicon Valley. Hussle owned several other businesses in the area, including a Fatburger restaurant, a barbershop and a seafood market. He had invested in the 59th Street Elementary School, giving shoes to all of the students and renovating its basketball courts and playground. 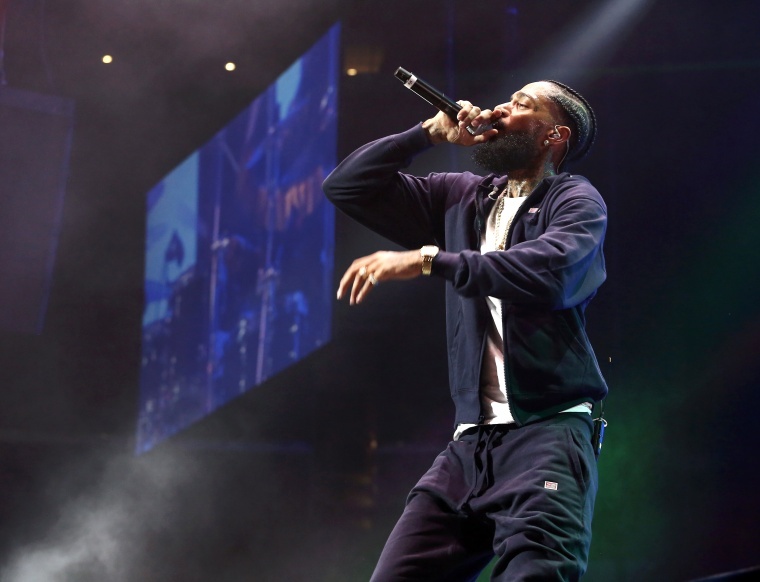 Imani Beal-Ampah, a longtime resident of the Crenshaw District in South Los Angeles, said she remembered when the rapper released one of his earliest singles, “Hussle in the House,” in 2009. Since then, she has seen the effect that Hussle had on her community. As an artist, Hussle found ways to disrupt the music industry through his tactics. He was signed to Epic Records, but the deal fell through in 2010. Three years later, he released his mixtape “Crenshaw” independently and unconventionally — by selling 1,000 physical copies for $100 each. (He sold out in less than 24 hours.) Last year, he released his debut studio album “Victory Lap” — in a strategic deal with Atlantic Records and his own record label All Money — which was nominated for best rap album at the 2019 Grammys. That “billon-dollar project” likely refers to Destination Crenshaw, a 1.3-mile outdoor space dedicated to the arts and culture of black Los Angeles. The project is a response to the city’s decision to put a section of the Los Angeles County Metro rail line at ground level along Crenshaw Boulevard. Community members lamented that the construction of that Metro line would harm local businesses, according to Curbed LA. Council member Marqueece Harris-Dawson told NBCBLK that often, outsiders come into communities he represents to capitalize off their assets and value while the community often doesn’t benefit. But Hussle stepped in to make sure that didn’t happen. He was one of the early supporters of the project. Though he’d been associated with the Rollin’ 60s Neighborhood Crips in his youth, Hussle was slated to meet with Steve Soboroff, president of the Los Angeles Police Commission, Los Angeles Police Department Chief Michel Moore and entertainment company Roc Nation to discuss ways to stop gang violence. In the last few years, he participated in anti-gun violence rallies, like the one in 2013, where he met Harris-Dawson. He wanted change, and he wanted it now. The impact of Hussle’s death is reverberating across the hip-hop world. Many of his fans will stream his songs and spit his lyrics to appreciate his storytelling skills. But for residents of the Crenshaw neighborhood who felt his impact more directly, many will miss his presence and commitment to uplifting others in the community.